Do the guys follow you or someone else? Papio ursinus, the Chacma baboon of Namibia, exists in small social stable groups on cliff top nesting sites in Tsaobis Leopard Park and so, unlike insects, schooling fish or other sociable creatures, it may not have organised instincts to coordinate its group movement. The findings of a prominent group of European biologists support the hypothesis that social animals living in small groups are indeed able to coordinate collective movements through adopting local rules-of-thumb. 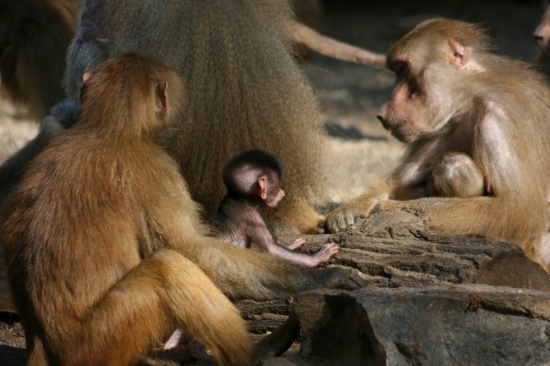 By rules-of-thumb, they mean the way in which baboons decide who to follow, based on the individual's social standing. I would think that sounds familiar to all followers of Twitter. The paper , by Andrew J. King, Cedric Sueur, Elise Huchard, and Guy Cowlishaw, entitled, "A rule-of-thumb based on social affiliation explains collective movements in desert baboons," seems confusing but has a lot to suggest about our own poor species, and others. "It appears that a baboon thinks 'OK, I'm going', and strides off purposely, so the rest follow," says Dr Andrew King from the Royal Veterinary College at the University of London, who led the study, published in Animal Behaviour. But if that male or female is of low social standing, nobody follows! The individual must be well-placed in the hierarchy in order for the whole group to rise up and troop off to feed. Baboon beauties are more likely to get bullied, Baboons prefer dining with friends, and even, Baboon dining etiquette. Hollywood beckons with paper titles like that! It now looks as though the group can continue and will be investigating group leadership. "We're now keen to find out if personality predicts whether or not baboons will be leaders," Andrew adds. I'm certain human politicians are watching and listening.